I got this puzzling little email from Shade Clothing in my inbox this morning. And to top it off, the crazy sale prices of last week have now all increased by a fair margin. Why did I not buy one of those belts and a striped tee?! What do you guys think of the news? Are you as sad as I? Leave your thoughts below. I just got my order today from their sale, so glad I ordered when I did! That's so sad to hear they're closing up. I hope they come back bigger and better than ever! I am optimistic about Down East though, I LOVED everything in their fall catalog. super sad. super, super, super sad!! i'm horrified! i did make a purchase last week, SO GLAD I DID. wish it would have been a ton more though! i am so sad, it has been my go to store for over five years. the explanation left me as confused as before. Thanks for posting this! I also got their email this morning and I was so confused. I'm very sad and still confused about the whole thing. I will definitely miss them. That's weird, I've bought tons of Shade and am on their mailing list, but didn't get this email. I found the indirectness and bit about not wanting to compromise the quality and therefore having to close kind of confusing. Also, it seemed like they were expanding, punching up the blog, etc. That is super sad though. I didn't realize they started in 2005. That's when I began buying their Ts, and half my wardrobe (I have a small one ;) ) has been from then since then. Bummer for them and us. But I'm glad I just got a bunch of stuff last week! Wish I got more belts! Can I be blunt though? I never found it more modest than a lot of cute brands (Maybe I'm missing something? I just avoid the teen brands). I first loved it b/c I needed long t-shirts for my body type, and they fulfilled that. I didn't wear them underneath stuff, so they were actually pretty tight (immodest!) on me. I will miss them b/c they were SUPER affordable, had great sales, were well made, timeless, and I loved that they kept the offerings online minimal. I loved supporting a store started up by a woman who didn't like what was out there. I'm not worried about finding clothes that will be appropriate for my 37 year old self, but just ones that I can find fast and afford! I really thought they were doing well. So sad for them. This is totally nutso, but not entirely surprising. 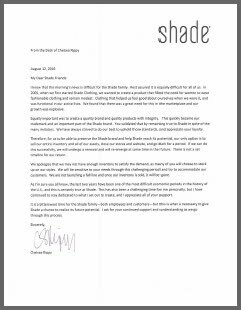 When I worked for DownEast Basics (Shade's rival) a few of my co workers kept saying things like they're going to go out of business soon, just based on their lack-lustre seasonal launches. Their stuff has always been great, just the last year I feel like they only put out a couple of new items each season. Anyway, it's sad. I'm always sad to see a company like that go under. Hopefully when they resurface they'll be better & awesomer than ever. What's strange to me is that I was on there the other day to get ideas for an order and when I go to the site now the prices are HIGHER than the other day????? I'm sad they're closing, but I think they went about it completely wrong. Just an all of a sudden email with "closeout" prices, which are more expensive than the sale last week. That seems tacky to me. I love Shade and their clothing, but this just rubbed me the wrong way. If they are able to come back, they're going to have to convince me again of their quality. Stuff like that could potentially bug me in different circumstances, but not in this situation. Unless I'm mistaken, it's a small company and was financially forced to do this. The prices are already pretty good. I can hardly blame them for trying to sell for more if there is a rush on now from their customers. I always felt like their final sales are unbelievably good anyway (I mean I just got some really cute dresses for 15 and a cardigan for 15). Is the buy out rumor true? 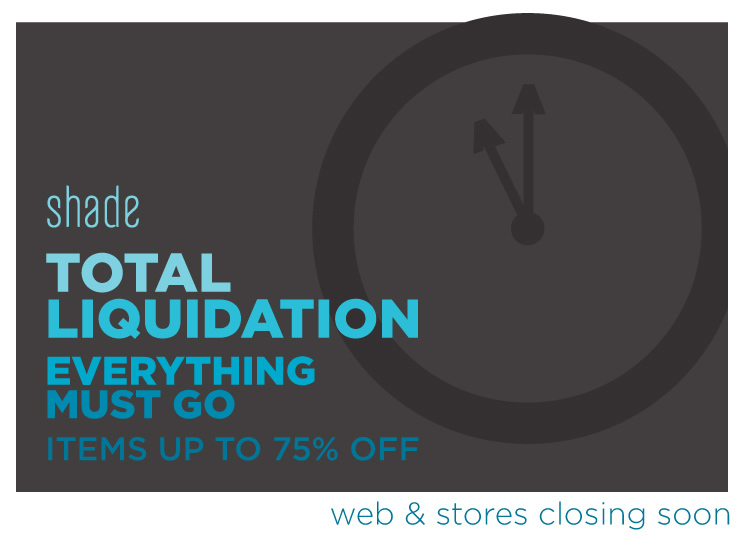 In reference to the raise of prices, that is totally standard procedure for a business closing its doors. The same thing happened at Circuit City, in fact the even raised their regular day to day prices by 10%. I guess it is standard business practice to recoup as much as possible. I really do hope that they come back soon. They are probably my favorite modest retailer. Normally the way these things are done is at some point a liquidation company pays a set price for the entire remaining inventory. That company then attempts to sell that inventory at as much profit as it can - it doesn't take into account what was being charged before, and the original company doesn't get any share of the profits. So the earlier low prices were probably the company trying to recoup as much as they could from the inventory before it was sold to the liquidator. Personally, I've always been too chicken to buy anything online without trying it on first, but all the stores you link here have been cute, so I'm sad for the rest of you.